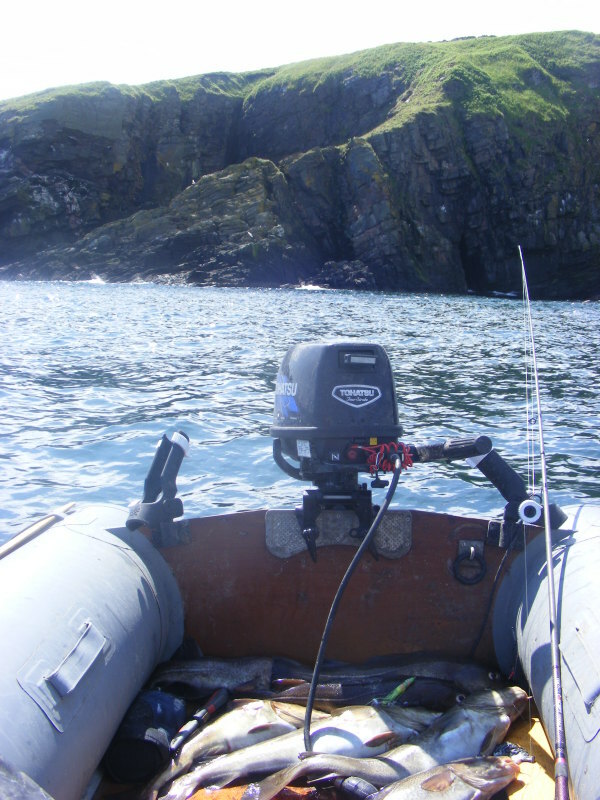 There’s not too much you can say about blanking when shore cod fishing. Especially when pretty much everything is in your favour – but that’s what happened at Aberdeen last weekend. The easterly gale had died away but the sea was still pounding in hard, with foam thick on the surface and a fine coffee colour to the water. My hopes were high! We were out from dawn until lunchtime and we didn’t have a touch between us, so it was a rather deflated angler who tramped back up the fields to his car. After my dire showing at the end of December I thought I’d give Aberdeen a second try, with my first outing of 2016. 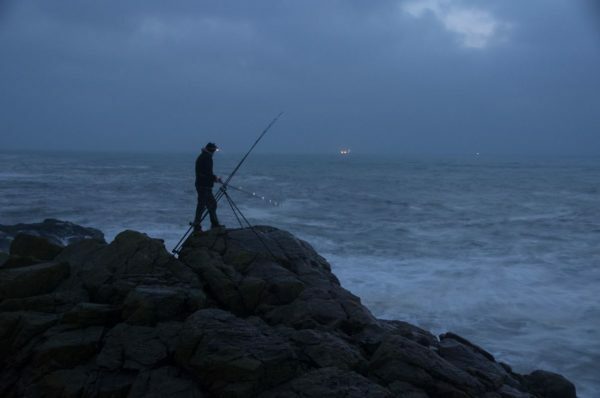 Gales and heavy seas (and flooding) have been pretty much continuous for the last couple of weeks but it looked like the worst of the seas had dropped back enough to make some of the marks fishable. Pre-dawn found me sploshing my way along to the Flat Stone through some quite deep water on the cliff paths – the worst I’ve seen along here for years and it showed the amount of rain that had fallen recently. The sand lining the bottom of the rock pools was evidence of the pounding received by the waves as the water here is around 35 feet deep and it takes quite a wave to really get the bottom disturbed. 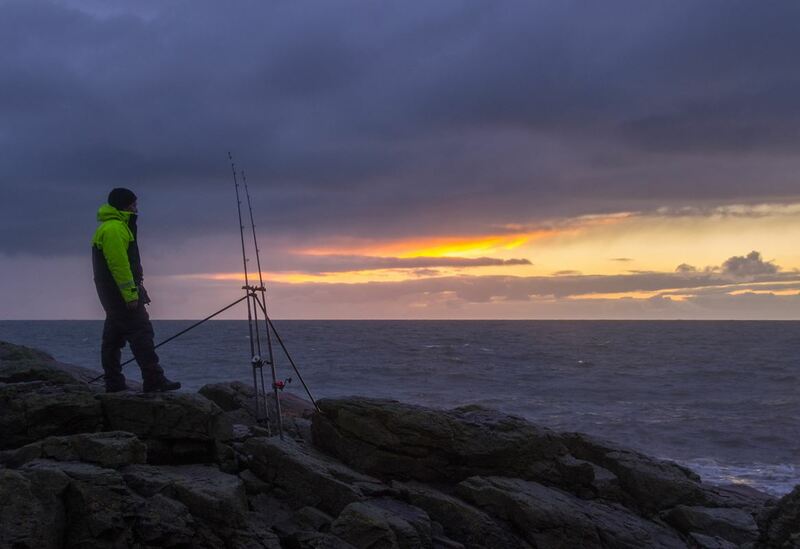 Light was creeping across the sky as I popped out a pair of rods – one with mackerel and another with lug and mussel, and then sorted out the obligatory coffee. And then another, and another. Still no bites. 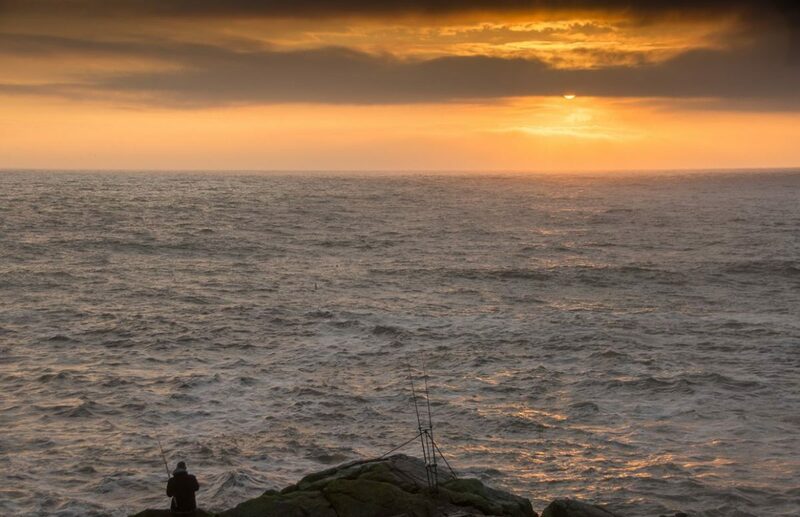 Two hours went by before I got a slack liner on the mackerel bait and managed to scrape a nice looking 4 1/2 lb codling up the side of the rocks without losing it to the swell pounding the rocks. This one was full of lugworm, probably shaken loose by the recent storms. 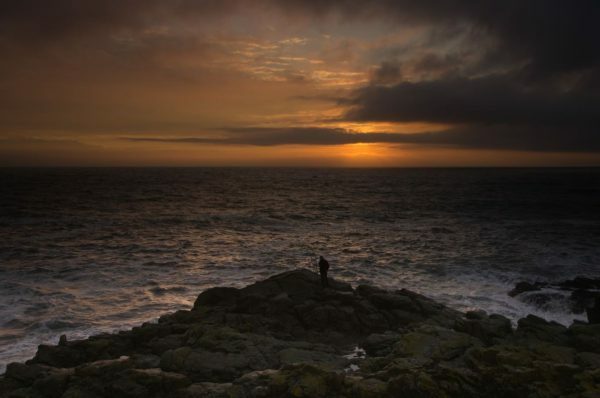 I stayed on the Flat Stone for a while longer but by now the seas were running a little too close for comfort so I decided on a move to the Square Stone, just up the coast. A couple of fishless hours later I even got forced off the Stone as towards HW water started washing over the bit I’m standing on the photo below. 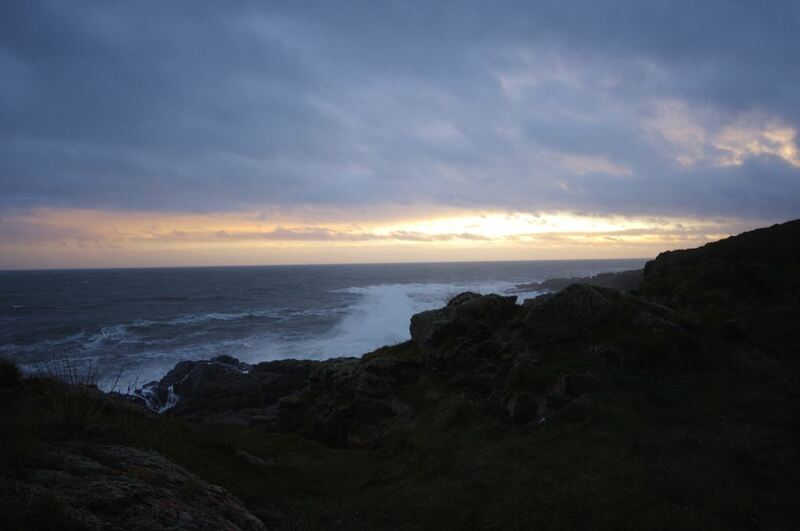 The swell appeared to build steadily from the ENE during the day although the wind stayed light, so probably a combination of the flood tide and something brewing offshore, but the Flat Stone was lethal by this stage. A traipse back towards Red Rock saw me finish off with another 90 minutes on the high mark there – complete with seaweed washed up 70 feet or so above the sea, so it must have been quite a storm at its height. However nothing doing so I admitted defeat and packed up for the drive home. Not exactly a sparkling start to the year but at least a blank was avoided and the freezer is no longer completely bare. Headed up Aberdeen way yesterday in search of a codling or two in what was forecast to be a large SE swell. Supposedly around 12 feet although I’d say it was a fair bit more than that, but with some real monsters thrown up by the back eddy. Maybe it was the angle of the swell, but effect was to make most of the marks dangerously unfishable and I had to beat a retreat to high mark at Red Rock, which is 60-70 feet above sea level. Two other refugees eventually joined me on my platform above the waves, but we probably spent as much time photographing the sea as we did fishing. Oddly enough it wasn’t too difficult to fish as it was mild and only a light wind blowing until late morning, and I could generally hold bottom with a 6oz grip lead. All of which makes it strange why all the baits came back untouched. I blanked 🙁 So did the other two anglers, so at least it wasn’t just me. I’ve had fish from the same spot in very bad conditions before so I’m a little stumped why there was nothing around, so all I can do is hang my head in shame. 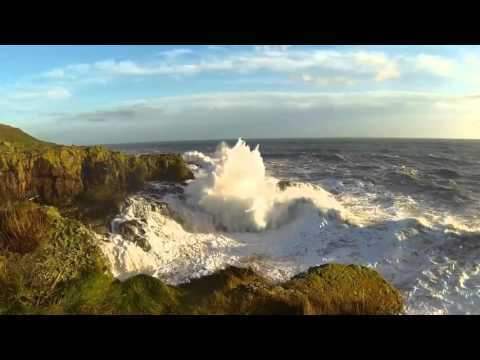 However the seas were impressive enough to persuade me to add a short video. 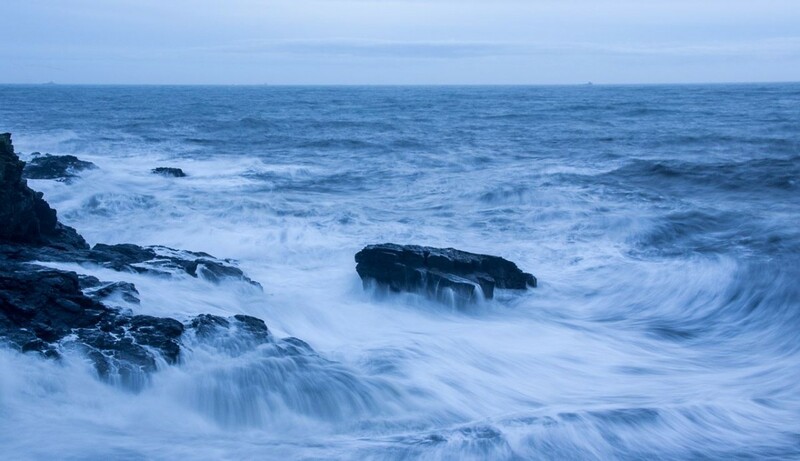 – although it’s difficult to convey their full impact without a life-size figure acting as a suitable target on one of the ledges getting blasted by the waves. 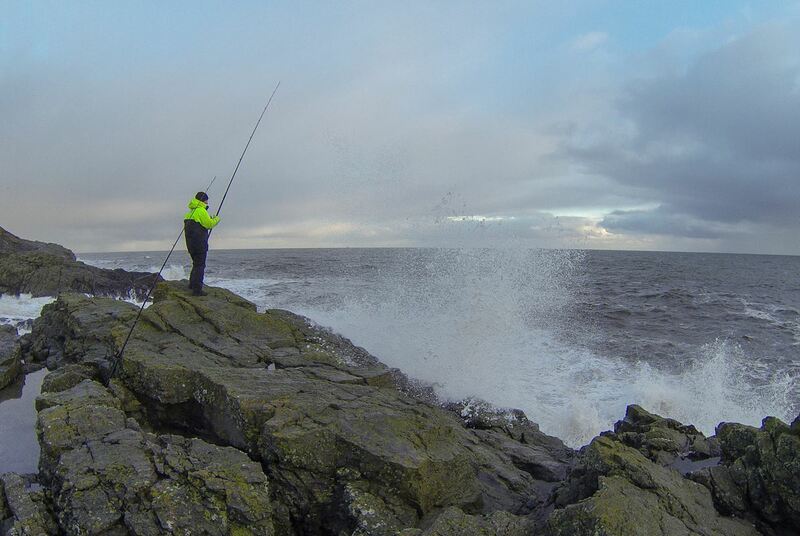 Rough in more ways than one… I was lined up to drive my M-I-L back to Aberdeen from Edinburgh after spending Christmas with us, so thought I may as well get a bit of shore fishing in as well, given that the weather looked suitably awful. 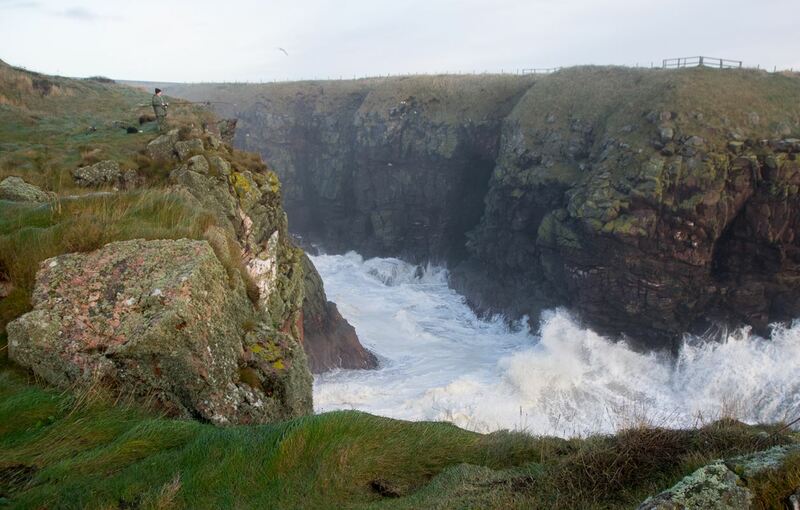 Duty done, I hit the cliffs around 2 in the afternoon to find a very large sea running. It was clear that most of the marks would be suicide to fish from so I headed for the Red Rock, hoping to find the Furnished Rooms still fishable and with the top of Red Rock as a fallback. A few minutes at the Furnished Rooms and it was clear that things were a bit too lively here and were only likely to get worse as the flood tide picked up against a hefty southerly swell, so I moved back to my “last resort” mark of Red Rock. Here things were pretty comfortable and well sheltered from a wind that had back to the SW so I managed to fish without difficulty. 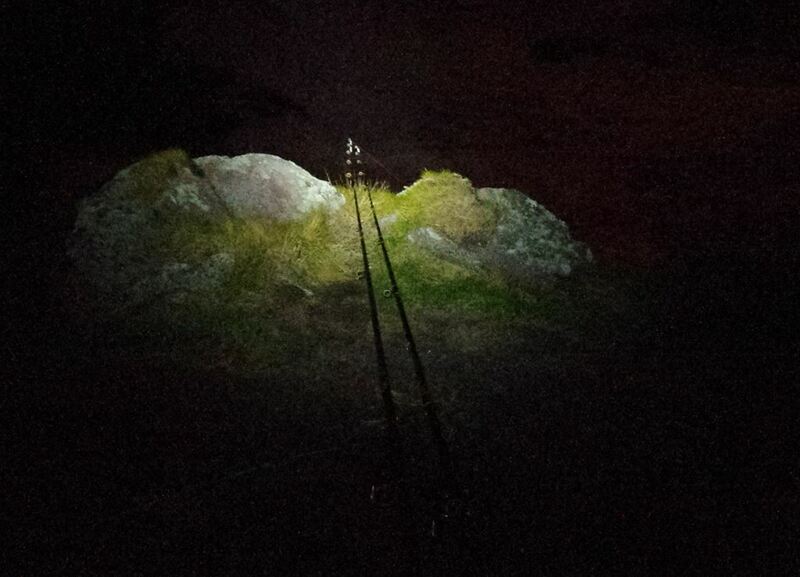 Keeping an eye on the rod tips whilst night fishing from the top of Red Rock, around 60 feet above sea level. 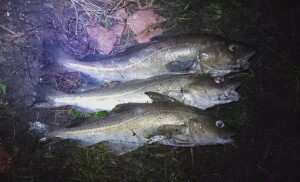 I fished roughly 2 – 9 p.m. for a total of 3 little codling, plus 1 about 4lb lost coming up the cliff and another much larger one (at least 8lb, probably more) that I just couldn’t lift out the water at all. 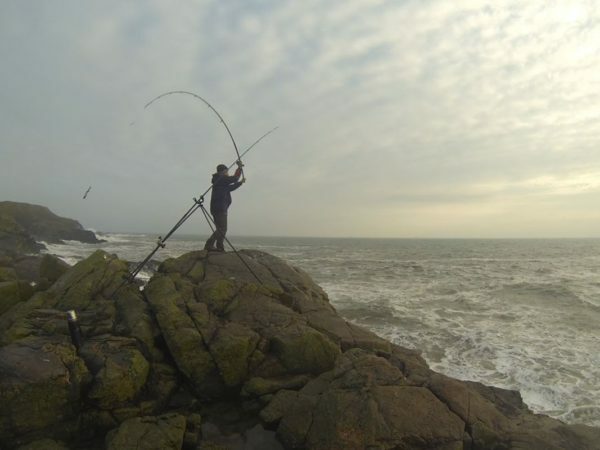 I was up on top of the Red Rock, so I knew there was no chance with the bigger fish, but I was annoyed about the 4lber as it was my own fault in letting the line go across a rock 🙁 Everything came to plain old lug baits, although I did try mackerel for a while on one rod. There was nothing at all for the first 4 1/2 hours, and baits came back untouched or got rolled into rocks by the sea, then I lost the bigger fish. All the other fish came between 7 and 8 p.m. and were stuffed with lugworm, so it was pretty concentrated fish-wise. Overall a pretty disappointing session as I’d hoped for better, but it was a nice afternoon/evening to be out – quite mild and well sheltered from the wind so not really a hardship to be out wave watching rather than catching. Some of the seas were huge, and the top of Red Rock was one of the only places you’d have been safe. 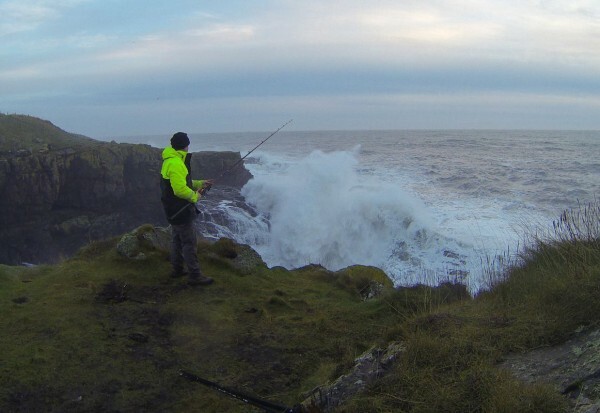 Another angler came down to the Furnished Rooms and was standing right on top of it when a wave just lipped over his feet – if he’d been down on the bit that people normally fish he’d have been washed off. He came round to see me afterwards to see if anything was doing (it wasn’t at that time) and then headed off to Nigg Bay. I’d expected it to be rough, but it was worse than I thought, especially when the flood tide kicked in. A nice bit of wild weather rock fishing in search of Aberdeenshire codling – good fun in stormy conditions, with half a dozen pan-sizd fish as a result. 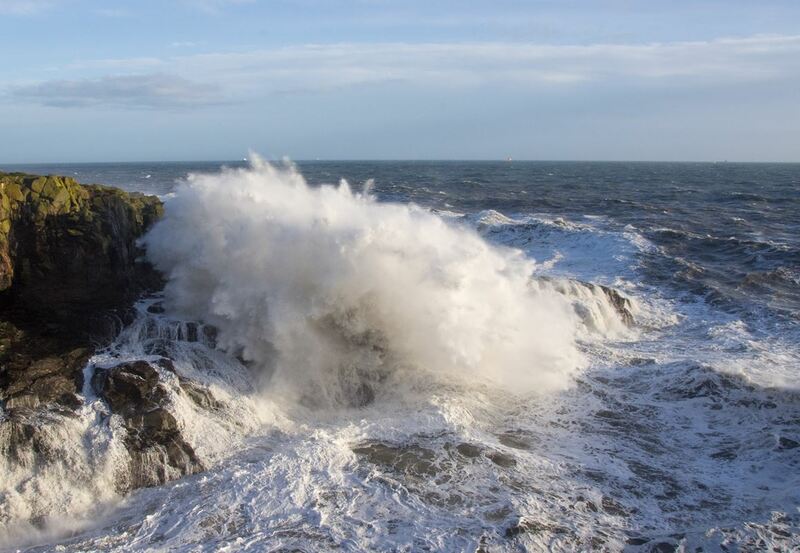 Tides: LW at 08:22 – large tide. First time up in Aberdeen for about a year, but I couldn’t let the winter pass by without at least one trip to the rock marks in search of codling. As I was hoping the sea was pretty rough after days of gales, which usually brings in fish eager to hoover up worms and crabs turned up by the waves. It was still dark as I shivered my way into my Fladden floatie suit and rock boots before making my way down towards the Flat Stone mark near Downies Farm. My bait of choice was lugworm and a few minutes later I lobbed a couple of rigs out as far as I could into the teeth of the wind and settled down to wait. 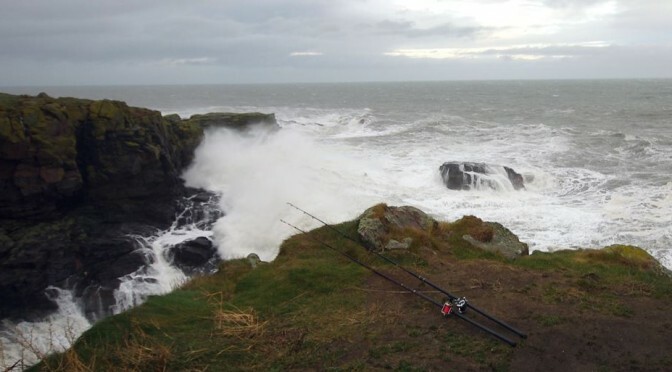 The sea was quite large but the main problem was the strong wind which made it difficult to spot bites and was really blasting past at times – nonetheless there was a reasonable stream of bites in the first few hours and 4 smallish codling were landed, with a couple more lip hooked specimens falling off as they were lifted up the cliff. Things then went quiet and I decided on a move down towards the Red Rock, partly to get a little shelter from the wind and also ‘cos the sea was slightly rougher and more easterly in direction than before and there was more spray around than before. I’d hoped to get on the high mark at Red Rock but this was already occupied, and it’s not really a spot for sharing, so I stopped off at the Furnace Rooms (or Furnished Rooms – depends who you listen to). In the conditions this mark was a little marginal, with heavy seas coming in rather close to the rocky casting platform and the occasional heavy lump of water crashing over the top of the rocks behind, so I cast out and then retreated a little up the rock for additional safety. The final ninety minutes produced another couple of codling, to just under 4lbs, before I called it a day. A grand total of 6 codling for the session, which isn’t too bad for this late in the season but I was somewhat underwhelmed by their size. 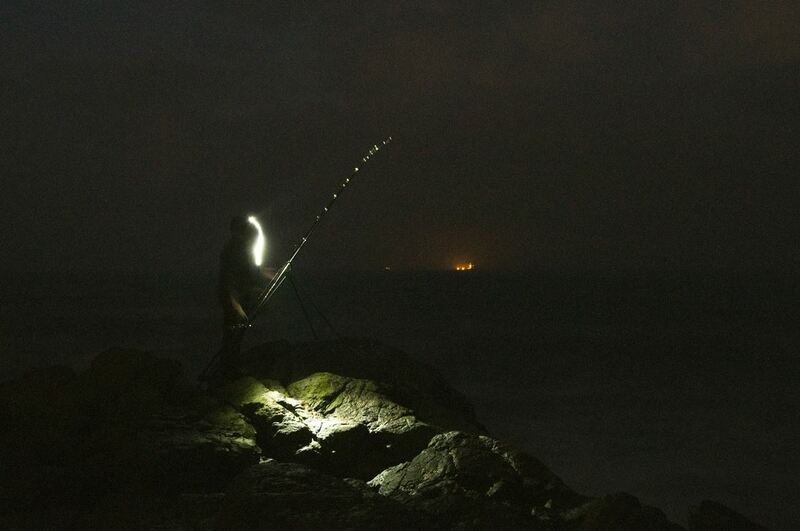 An after-dark coddie session from the cliffs. 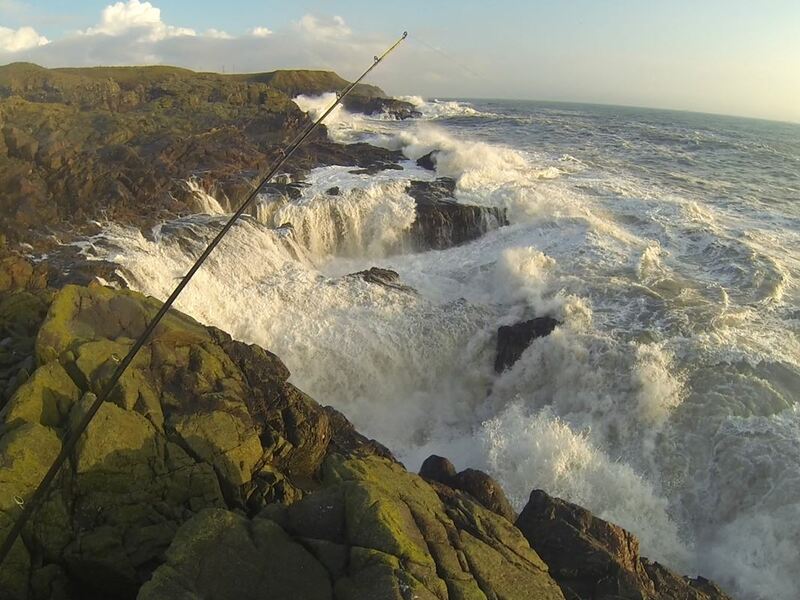 Only three fish winched 50 feet above a raging sea to show for my efforts, but a good night for all that. where it was obvious a large easterly swell was running, and a little larger than I’d anticipated. I spent a few minutes surveying the Furnished Rooms before deciding that sooner or later a wave was going to sweep straight over them (which it did several times later in the evening), and then headed over to the high mark at Red Rock. At something like 5 storeys above sea level it’s pretty safe from the sea, but rather exposed to any wind and very difficult to land a decent fish from. Fishing wise it was OK, just rather difficult to track any bites in the rather wild wind and water combination. I only had three codling to show for my efforts, plus another one lost, but it was good to get out and the night was pretty impressive in respect of the conditions. A fair heap of late season wrasse from Findon, on crab left over from smoothie fishing down the Solway earlier in the year. Only a single codling appeared, but it was a lovely day to spend lazing away on the rocks before winter descends properly. I’d a day of annual leave to use up, so I decided to give Aberdeen a bash from the shore. Forecasts were for decent weather but only a light swell, and so it proved. Findon was the most obvious mark to fish in calmish conditions and a falling tide, so that’s where I headed first to drown a few frozen peelers (if that’s possible!). Action was reasonably fast, with several wrasse taking the bait and a good number lost in the kelp. 4 ballans is easily my best tally at this time of year, and they were all a respectable size. I did hope for a few cod, but only one small codling appeared which was a little disappointing. By half three I’d had enough of the wrasse and decided to move to Altens in the hope of more cod. 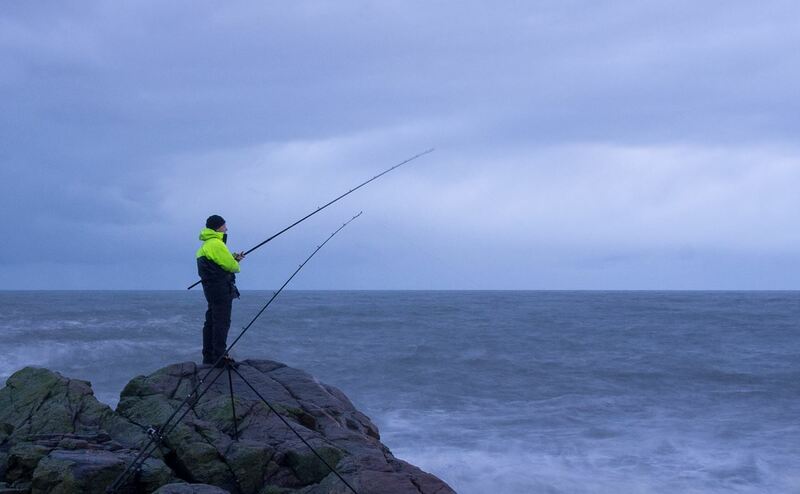 Unfortunately things were dead quiet here, with only a solitary coalfish turning up, despite pretty good conditions. Overall a relaxing enough day, with a decent amount of sunshine as a bonus. 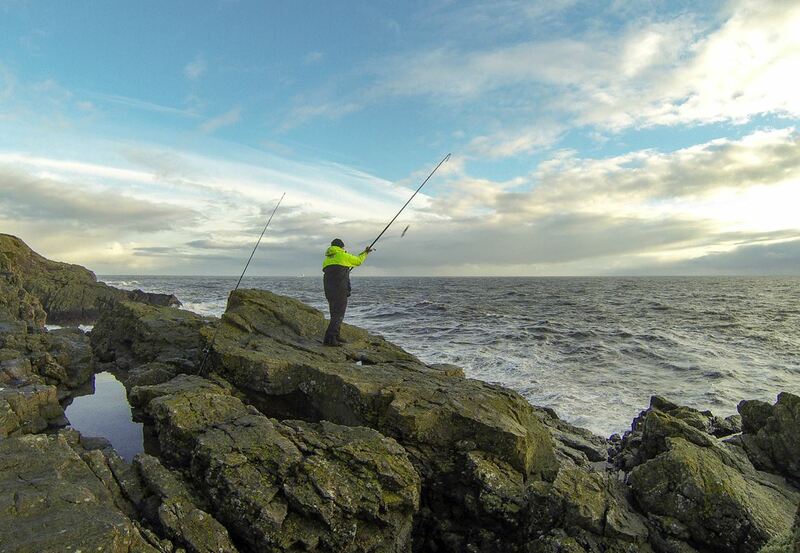 First time up in Aberdeen for a few months, and marks like the Red Rock were crowded with mackerel bashers. Altens was empty as usual so I set up a couple of bottom rods with frozen crab and also tried a float fished mackerel strip for a little while. Fishing was fairly slow, but I contrived to miss a couple of bites as well as land 3 codling and a seagull (!). A lot of lobster pot buoys about which restricted options a little. Highlight of the evening was a very nice fish that took crab about 60 yards out – as soon as it felt the hook it just powered away smoothly against a heavy set drag and managed to pull off a good wadge of line. This happened repeatedly for 2-3 minutes – each time I made progress it turned and ran back. I could feel the line rubbing against kelp and rock all the while, and it was pretty obvious it wasn’t going to come in so it was no great surprise when the line finally abraded through. 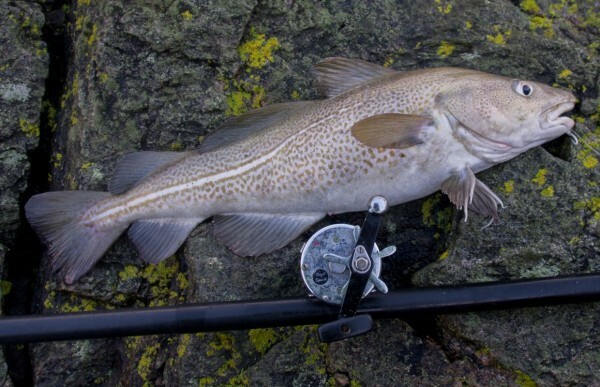 As to what it was – most probably a good cod, possibly a large pollack. I’ve had several fish in the 8-9lb range from this mark and it was substantially better than any of them. Ah well! Sea Conditions: Pretty rough, with a SE swell running 8-12 feet and a fair bit of colour. Armed with some hard won lugworm I decided on an early morning start up at Aberdeen, targetting a few codling. The forecast was for fairly rough conditions but dropping a bit later, so first light looked like my best bet and 6.30 saw me pull up outside Downies farm. Initially I wandered down across the field (through ankle deep cowshit) towards the Flat Stone, but immediately decided to move towards the Square Stone as it appeared just a bit too rough at the Flat Stone – it was still dark and I didn’t fancy making a mistake! The Square Stone was fine and I fished here for about 3/4 of an hour until it got light. Looking around I decided that the Flat Stone was perfectly fishable and that it would probably outshine the Square Stone, so it was a 10 minute hike back round again. The move paid off, with three codling in the next hour, best 4lbs 12oz, whilst a couple of guys who came down to the Square Stone just after I left it didn’t seem to catch anything. However, initial success gradually turned to despair as the next three hours proved fishless and biteless, apart from a chunky velvet crab. A fourth codling turned up a little after noon, but that was my lot until I packed in around 1.30pm. Although I suspect I was still a bit happier than the passengers on the Shetland ferry which had to pound up and down the coast for about three hours waiting to get past Aberdeen harbour bar safely.